A rising star in the Democratic Party and a Republican former mayor won their parties' primaries on Tuesday to set up a campaign of political and stylistic contrasts as they seek to fill the final 15 months of the term of the late U.S. Sen. Frank Lautenberg. 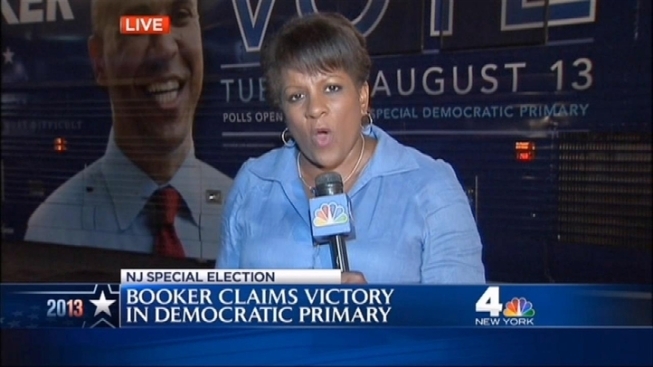 Newark Mayor Cory Booker defeated three experienced politicians — U.S. Reps. Rush Holt and Frank Pallone and state Assembly Speaker Sheila Oliver — in a Democratic primary that may have been more competitive had the field been less crowded. The race was a major draw for them partly because of New Jersey's history of electing only Democrats to the Senate over the past 40 years. In the Republican primary, former Bogota mayor Steve Lonegan won handily over Franklin Township physician Alieta Eck, who had never run for office before. With about 60 percent of precincts reporting late Tuesday, Booker had about 75 percent of the vote in the Democratic contest, with Pallone, who had the support of Lautenberg's family, a distant second. Lonegan had about 80 percent of the vote in the GOP contest. The election is on a compressed schedule. The day after Lautenberg's death in June, Republican Gov. Chris Christie scheduled the primaries for Tuesday and a special election for Oct. 16, 20 days before the voting day on which he's seeking re-election. The move drew criticism, with some opponents saying Christie was spending $12 million on an extra election so he could avoid being on the same ballot as Booker, a claim Christie denies. Booker ran with the support of New Jersey's Democratic establishment and celebrities from across the country. Oprah Winfrey joined him at a fundraiser, and Eva Longoria campaigned with him. Booker is famous in the political world for his life story and his social media fanaticism: He has 1.4 million followers on Twitter, which he uses to field complaints about local issues such as sinkholes and to dispense inspirational quotes. He grew up in suburban Harrington Park, the son of some of the first black IBM executives, played football at Stanford, won a Rhodes scholarship, received a law degree from Yale, then moved into one of the toughest parts of Newark in an effort to revive the state's largest city. He is in his second term as mayor. In the city, reviews are mixed, but his narrative has helped make him well-known elsewhere. And he's leveraged that power to help bring in hundreds of millions of dollars in grant money for the city, including a $100 million pledge from Facebook founder Mark Zuckerberg. He's also given 90 paid speeches across the country since 2008, collecting $1.3 million, nearly half of which he has donated to charity. Lonegan, who stepped down from his job as state director of the anti-tax group Americans for Prosperity, focused his primary campaign on blasting Booker. He held a news conference to ridicule Booker's broad anti-childhood poverty plan and another at the scene of a homicide in Newark to question whether Booker has done much to reduce crime. He's also been to the New York headquarters of Waywire, a technology startup Booker co-founded, to criticize his role in it. In a fiery victory speech in Secaucus on Tuesday night, Lonegan blasted Booker as a candidate "anointed by Hollywood" and the top choice of "Silicon Valley moguls" who want to make him California's third U.S. senator. Lonegan said he would ignore pollsters and pundits and emphasize personal freedom and reducing the role of government and particularly push to repeal President Barack Obama's health insurance overhaul, which Booker supports. "We know what we believe in," he said. "We're going to say what we believe, and when we go to Washington, D.C., we are going to do what we say." For Booker, the new opponent means needing to gird himself for attacks from the right after spending an abbreviated primary campaign being criticized from the left by opponents. In debates, Booker found himself defending working with Christie, explaining that he disagrees with the governor "90 percent of the time" and promoting his conciliatory image. He also reaffirmed his support for using taxpayer money to send children to private schools, one of the few policy prescriptions on which he and Lonegan agree. Lonegan is a familiar voice in New Jersey politics, blunt and conservative. He ran in and lost gubernatorial primaries in 2005 and 2009. He was a leader of successful opposition to ballot measures that would have raised a state sales tax and funded stem-cell research. Like Booker, he grew up in suburban Bergen County, in Ridgefield Park, and played college football, at William Paterson. Both candidates also became better known through documentaries released in 2005. "Anytown, U.S.A." looked at Lonegan's fiery re-election campaign in Bogota, and "Street Fight" chronicled Booker's first, and losing, run for mayor of Newark.